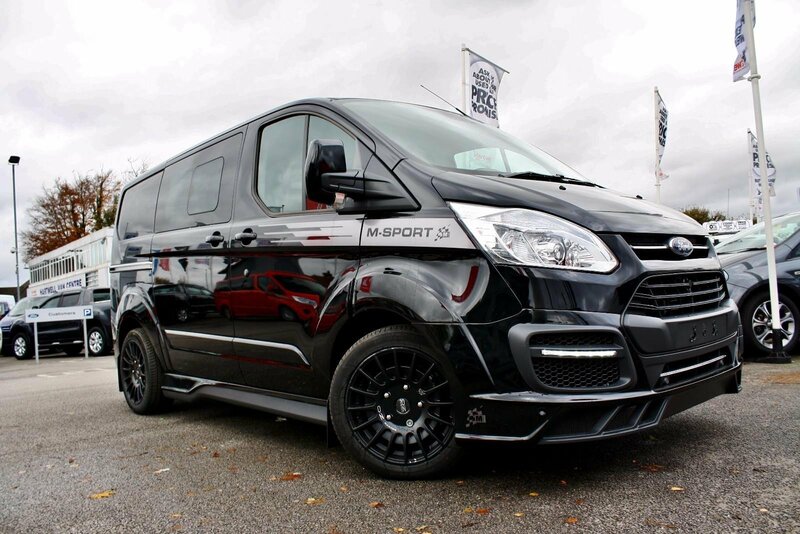 Official photographs of the new motorsport-inspired MS-RT Ford Transit Custom have been revealed as the model made its official debut last week in South Wales and attended by Fleet Transport. The MS-RT Transit Custom features style and practicality matched by no other vehicle on the road, with a choice of panel van or double cab options and two different wheelbases. Based on the latest generation Ford Transit Custom, the all-new model from MS-RT uses technology and aerodynamic influences from Ford’s M-Sport works-backed rally team to create a performance version of the ‘blue-ovals’ most popular commercial vehicle, each of which is hand-finished at MS-RT’s custom-built factory in Gwent, South Wales. The new MS-RT Transit Custom’s exterior styling includes a full front bumper and grille replacement with integrated factory fog lamps, extreme front diffuser, wide body arch extensions, sills, rear diffuser and rear spoiler, all of which are manufactured by MS-RT at its factory in Pontypool, South Wales. It also comes with a twin sports exhaust system, along with unique MS-RT exterior branding and decals. The MS-RT Transit Custom also gets exclusive new 18-inch Anthracite OZ Racing alloys with 103 XL load-rated Hankook Ventus S1 evo2 tyres, along with Eibach performance lowering springs. The combination improves handling and responsiveness, while at the same time ensuring the Transit Custom still delivers where it needs to by maintaining its payload capacity. Inside, the performance theme continues with a handcrafted MS-RT nappa leather and suede seat facings, along with a distinctive MS-RT sports steering wheel with carbon fibre inlays. The rally-inspired interior theme is completed with MS-RT branded floor mats and dash clocks. All MS-RT vehicles come with Ford’s latest SYNC3 entertainment system with satellite navigation, dual side loading doors, loadspace lighting, a 230v power convertor, parking sensors, reversing camera, heated windscreen, heated seats and upgraded HID headlights with integrated daytime running lights. Under the bonnet, the van has Ford’s 170PS EcoBlue 2.0 litre TDCi engine, giving 405 Nm of torque. A choice of six-speed manual or six-speed automatic gearbox can be specified. There are also a number of cabin layouts – two-seat panel van, three-seat panel van, five-seat double-cab and six-seat double-cab, with a choice of long or short wheelbases and a tailgate or twin back doors.